One of World Vision’s disability-inclusive WASH programmes: In Timor-Leste, Isaias and his family enjoying clean water from the well. “Now we do not have to walk one hour to fetch water in the river; my family was able to access clean water close to home,” said Julião Rodriques. He has four children, one with a disability, named Isaias Martins, 21-year-old. Millions of people around the world are in a situation where safe drinking water is a luxury rather than provided as a basic human right. People with disabilities face even greater challenges when it comes to accessing Water, Sanitation and Hygiene (WASH) facilities and programmes. At times, governments and organisations that intend to help communities with WASH infrastructure may unintentionally exclude people with disabilities by overlooking the barriers that they experience. The article looks into the case study on disability inclusion in WASH conducted by World Vision Lanka and Christian Blind Mission (CBM) Australia, in particular the partnerships with Disabled People’s Organisations and Civil Society Organisations to achieve inclusive WASH outcomes. 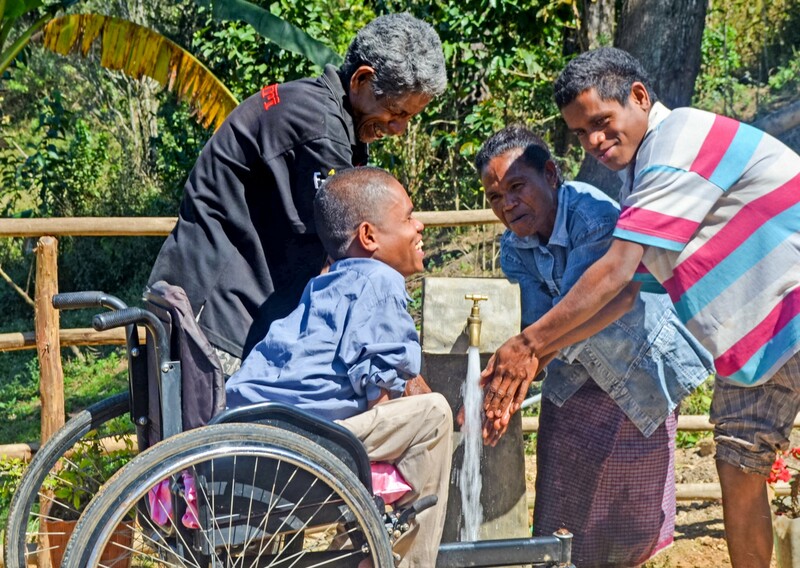 Funding from Australian Aid’s Civil Society WASH fund supported World Vision to provide disability inclusive WASH programmes in Papua New Guinea, Sri Lanka and Zimbabwe. World Vision partnered with CBM Australia, Disabled People’s Organizations (DPOs) in country and Civil Society Organisations (CSOs) to ensure the needs and priorities of those disabled are considered in every aspect of WASH programmes, including design and implementation. In-country DPOs assisted by technical support from CBM Australia, collected baseline data to assess the needs of target populations. This exercise helped to build trust and reach more people with disabilities among the communities involved obtaining important information about their needs and priorities. DPOs also provided crucial input into WASH infrastructure design and development. For example, specific feedback was provided on the need for railings at tap stands and distance between handrails and toilets. In Sri Lanka, World Vision team was able to advise on how to adapt household toilets to be accessible using low cost and locally sourced materials. Furthermore, DPO partners participated in raising awareness to communities about their rights and legal responsibilities under the UN Convention on the Rights of Persons with Disabilities (CRPD). importance of inclusion in designing and implementing WASH programmes. Communities saw first hand the capabilities of disabled people which helped to change discriminatory attitudes. Greater reach to people with disabilities in the targeted communities. The baseline disability assessments allowed DPOs to visit previously unseen remote locations and access a broader number of people with disabilities who could access support and services. An increased profile and partner networks. Disabled People’s Organisation accessed local authorities and partners they did not know previously which helped to raise awareness of the needs of people with disabilities. Ongoing relationships and partnerships have been formed opening up new opportunities for further collaboration. For example, World Vision PNG worked with the Assembly of Disabled Persons (ADP) to develop and gain funding from Australian Aid’s Water for Women Fund. Inclusive WASH programming requires investing in essential partnerships with Disabled People’s Organisations and Civil Society Organisations. A dedicated inclusion officer in your organisation can help to facilitate the partnerships and act as a broker to provide information, assist with planning and provide technical support for capacity building. Disabled People’s Organisations are often key change agents and can raise awareness with partners and communities about the need for disability inclusion and how to identify and overcome barriers. Financial investment in Disabled People’s Organisations can greatly increase their opportunities, strengthen engagement and reach to rural populations and improve project outcomes. Likewise, investing in teaching your staff about disability inclusion can have far-reaching benefits across the organisation’s programmes. Article was written by our Gender and Hygiene Promotion Advisor, Karen Hobday. Karen is an experienced public health consultant with a demonstrated history of working at the World Health Organization, development sector and higher education industry. She is skilled in maternal health, health promotion, sustainable development, humanitarian work, and research design/analysis. Karen is currently undertaking a PhD focused in global maternal health at the Menzies School of Health Research, Charles Darwin University, Australia. Reach out to her via LinkedIn or email.